DIVISION (g): 0.001. CAPACITY (g): 60. 2 halogen 60 W lamps. Diameter of the weighing plate: 90mm. Drying temperature: up to 160°C. Heating time (100°C): approximate time of 3 min. Drying time: up to 10h. USB port for connection to PC. - ACCREDIA calibration with issuing of the relative certificate. Drying modes: end when reaching the established time, automatic end. 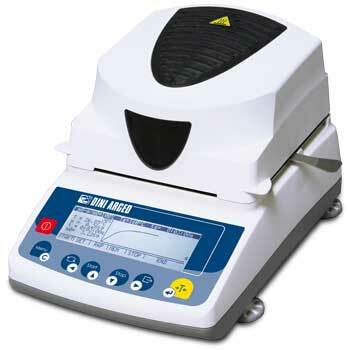 Calculation methods: % of dry weight, % of humidity in relation to initial weight or to dry weight. Memory for up to 10 customized programs (mode, temperature, time, calculation method). Calculation and printing of the statistical evaluations. Entering free texts and computing the report through external PC keyboard.